Polish group Puro joins forces with Conran + Partners to create a flagship hotel in Kraków’s historic Jewish quarter. Once overshadowed by neglect, the neighbourhood of Kazimierz has undergone something of a renaissance in recent times. The historic Jewish quarter at the foot of Kraków’s Old Town has emerged as a thriving hub for creativity, with art galleries, vintage shops and shabby-chic cafés lining the streets amidst a rich urban fabric of 16th-century synagogues, museums and Gothic churches. Adding to the mix in a bid to capitalise on what has become a major tourist hub, Puro Kraków Kazimierz – a new flagship from Polish hotel group Puro – fuses the newfound bohemianism of its location with more progressive principles, demonstrating the brand’s passion for contemporary art, design-led furniture and forward-thinking hospitality. Masterminded by local architectural practice ASW Architekci, the 228-key property occupies a corner site on the district’s Halicka Street and uses exposed brick to conform with its crumbling neighbours, while inside, London-based Conran + Partners draws upon the historic and cultural layers of Kazimierz, from its former warehouses and workshops to its recently-acquired galleries, street art and food culture. 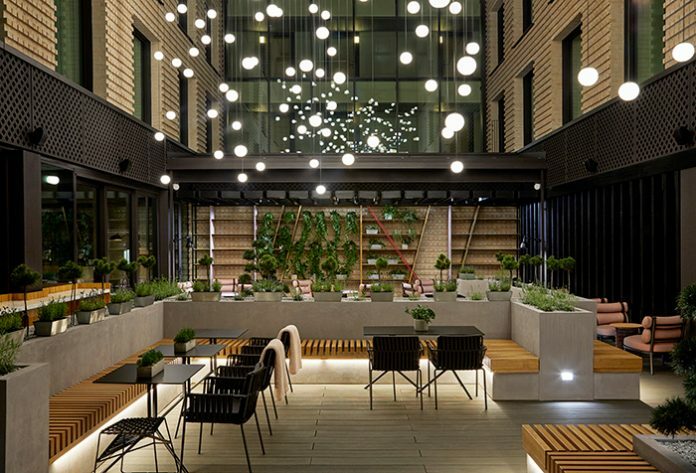 As Puro’s second project in Kraków, the hotel’s connection to its immediate surroundings was crucial. 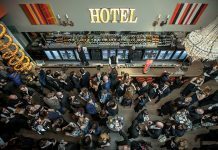 “The group already has a hotel in the city known as Puro Kraków, so we wanted this property to be definitively Kazimierz,” Kincaid confirms. On entering the lobby, an etched outline of the neighbourhood’s street pattern and bold graffiti art by Polish creative Nawer provide a taster of the locally-inspired artwork collection found throughout, which includes two modernist cityscape collages by Mateusz Szczypinski and a neon-style light installation by Spanish artist Javier Martin. Art curation was undertaken by Puro’s in-house consultant Zuzanna Zakaryan, who commissioned five Polish illustrators including photographer Dominik Tarabanski to showcase their paintings across the guestrooms, reception and bar, and collaborated with Conran + Partners on the styling for events space The Workshop. The palette mixes natural, raw materials such as terracotta, well-worn bronze and reclaimed timber with bold splashes of colour and the black-and-white layered tones of the Puro brand, complemented by refined selection of furniture from the likes of Kettal, Fritz Hansen and Moroso. Furthering local nuances, an array of greenery references the foliage that typically overhangs the old walls of the district, while an atrium to the rear of the lobby features a dramatic, hanging light installation inspired by the overgrown courtyards of the area. 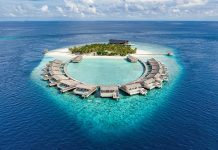 Culinary offerings include two on-site eateries, both of which have street-side entrances to draw in locals, who can dine without the need to pass through the hotel. Mak Bread & Coffee dispenses freshly baked bread, pastries and cakes amidst a cosy setting housing a sunken lounge, open fire and large sharing table, while Halicka Eatery & Bar serves locally-sourced Polish favourites such as trout and smoked cottage cheese dumplings, revamped by Head Chef Miłosz Kowalski. 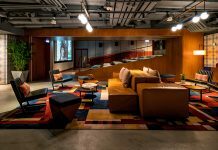 Taking cues from the site’s industrial heritage, events space The Workshop comprises four meeting rooms that can accommodate for up to 100 guests as either a series of areas or one single venue. 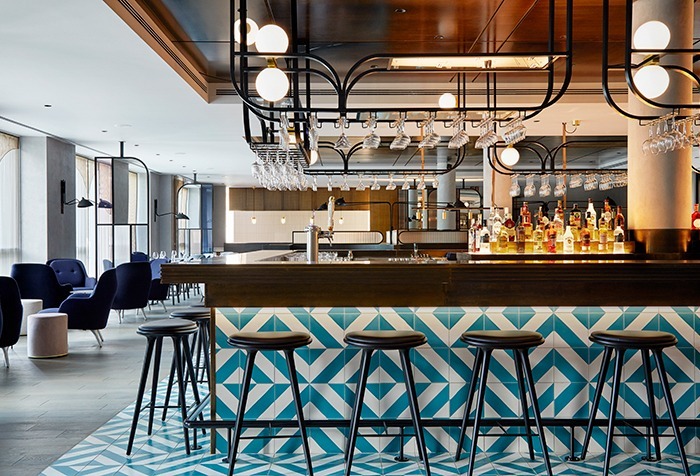 The rooms seek to reference the district’s artisan roots using a monochrome palette of concrete, Crittall glass windows and plywood, which help to fashion four distinctive themes alongside a large collection of enamel, glass and terracotta accessories. For those who might overindulge on the hotel’s delectable cuisine, a dynamic programme of wellness activities includes a morning run club and evening pilates, whilst the Prisma Spa encompasses a gym, sauna and steam room, as well as beauty stations and treatment rooms stocked with products by Alba1913 – one of Poland’s oldest skincare brands. Similar to the public spaces above, the wellness facility blends natural materials with industrial finishes, while bold shades are injected in the form of emerald-coloured tiles, vivid pink flooring and a saturated blue ceiling. Echoing the aesthetic of the ground floor, residential-style guestrooms are flooded with natural light via floor-to-ceiling windows and feature generous bathrooms separated by a fluted glass screen and kitted out with fittings from Hansgrohe’s Axor range. 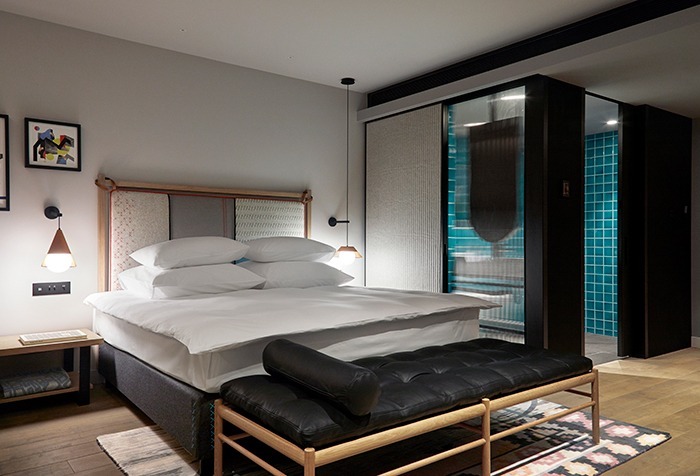 Beds are backed by bespoke, woven headboards and covered with specially designed throws that reference one of Conran’s earliest concept sketches for the project, while finishing touches include hand-knotted rugs by Golran 1898 and Danish heritage lighting from &Tradition. 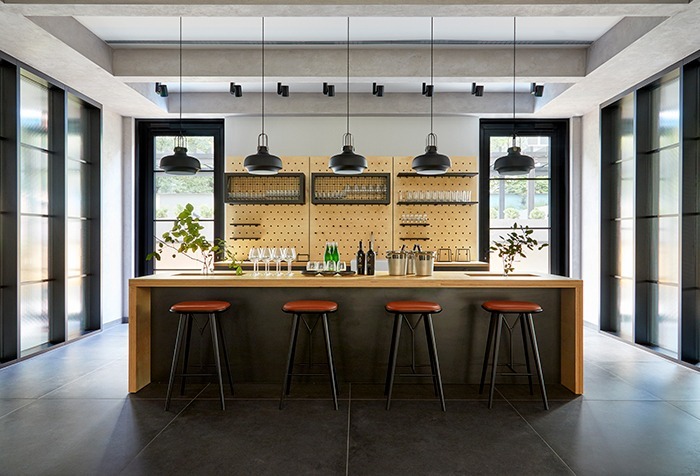 As its sixth property in Poland, Puro Kraków Kazimierz is a true reflection of how the brand has evolved since its inception. Balancing past and present in every detail, the hotel echoes the neighbourhood that surrounds it, cultivating an atmosphere of design, art and wellness. 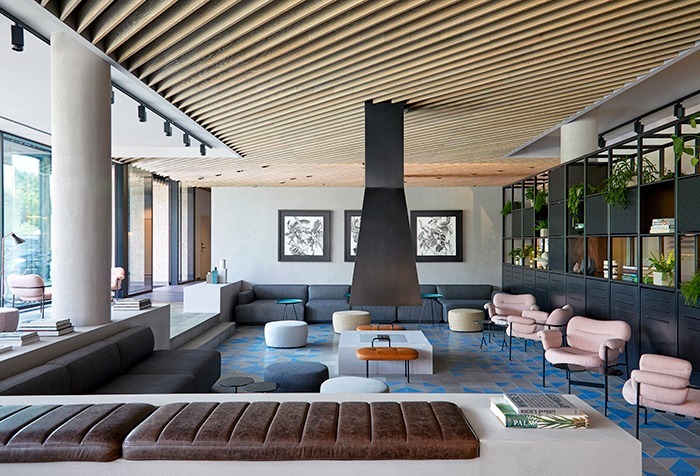 Up next for the group is Puro Hotel Łódz, where they plan to channel the creative spirit of filmmaker Alfred Hitchcock to produce a similarly authentic result in the heart of the former textile-manufacturing hub.